David “Dave” William Cowens (born October 25, 1948, in Newport, KY) is a retired American professional basketball player and NBA head coach. At 6’9″, he played center and occasionally the power forward position. Cowens attended Florida State University from 1967 through 1970. He was inducted into the Basketball Hall of Fame in 1991. 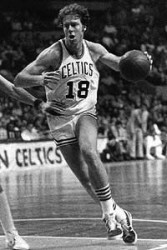 Dave was the 4th overall pick in the 1970 NBA draft by the Boston Celtics. Cowens was the 1971 NBA Co-Rookie of the Year, 1973 NBA MVP, and 1973 NBA All-Star game MVP. He won two championships with the Celtics in 1974 and 1976, and was a seven time All-Star. He finished his playing career with the Milwaukee Bucks. In 1996, Cowens was selected to be on the NBA 50th Anniversary All-Time Team. Cowens was the head coach of the Charlotte Hornets from 1996 to 1999 and the Golden State Warriors from 1999 to 2001.